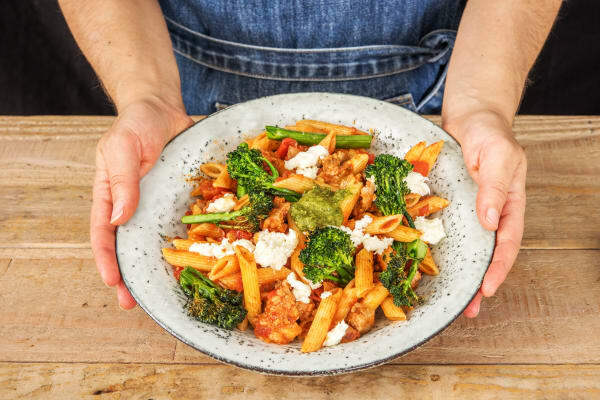 Crispy roasted tenderstem broccoli, a rich tomatoey ragu, fresh pesto and creamy mozzarella are the winning combination in this simple pasta recipe. 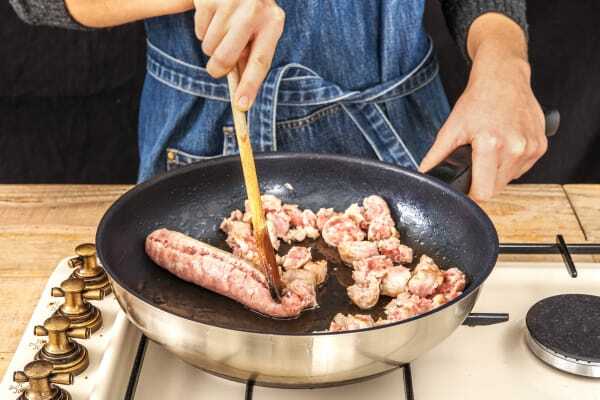 Using our delicious pork and oregano sausages as the base of the ragu makes this recipe quick and easy to cook, ready in just 25 mins. Serve up in bowls and top with the remaining mozzarella and a spoonful of pesto for a fresh finish. Preheat your oven to 200°C and bring a large saucepan of water to the boil with a pinch of salt for the pasta. Cut the broccoli stalks in half widthways. 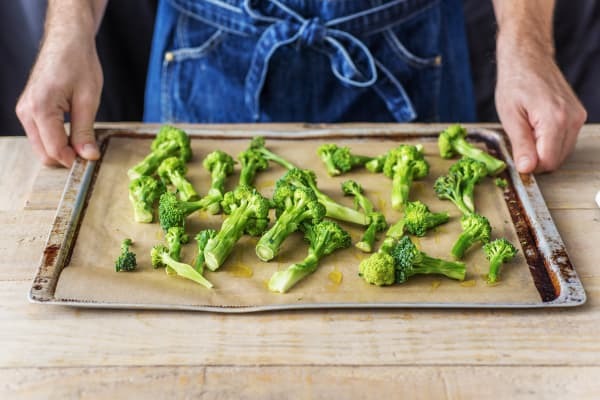 Pop the broccoli on a lined baking tray and drizzle with oil, a pinch of salt and black pepper, toss together and spread out in a single layer. Leave to the side. Heat a drizzle of oil in a large frying pan on medium heat. Once hot, add the sausage meat and cook, whilst breaking up into roughly 2cm chunks with a wooden spoon. Stir and cook until browned, 6-7 mins. 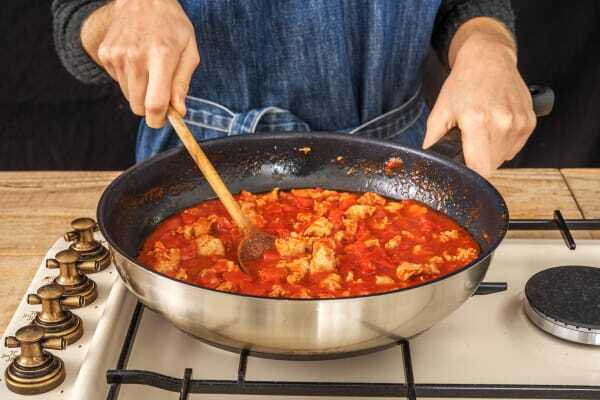 Pour the finely chopped tomatoes, tomato purée and water (see ingredients for amount) into the pan with the sausage meat. Mix together, reduce the heat to medium- low and simmer until thick and tomatoey, 12-15 mins. Stir occasionally. Once the sauce is simmering, pop the broccoli on the top shelf of your oven to roast until soft and charred at the edges, 10-12 mins. 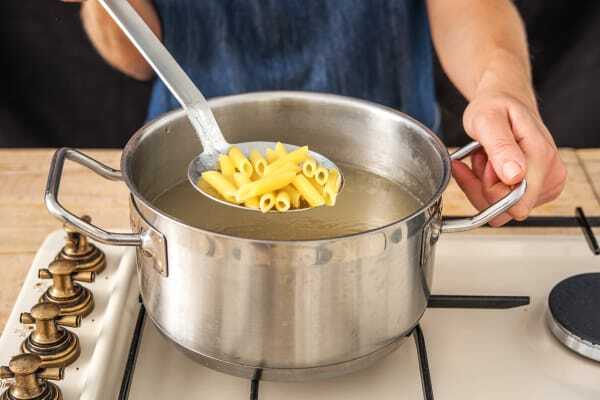 Add the penne to the pan of boiling water and cook until al dente, around 7-8 mins. TIP: ‘Al dente’ simply means the pasta is cooked through but has a tiny bit of firmness left in the middle. While everything cooks, drain the mozzarella and then pull it apart into small chunks. 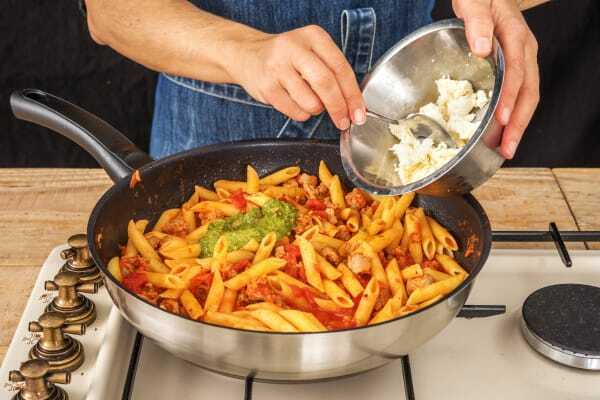 Once the pasta is cooked, drain it in a sieve and add it to the pan of sauce along with two-thirds of the mozzarella and two-thirds of the pesto. Stir together until combined. Taste and add salt and pepper if you feel it needs it. 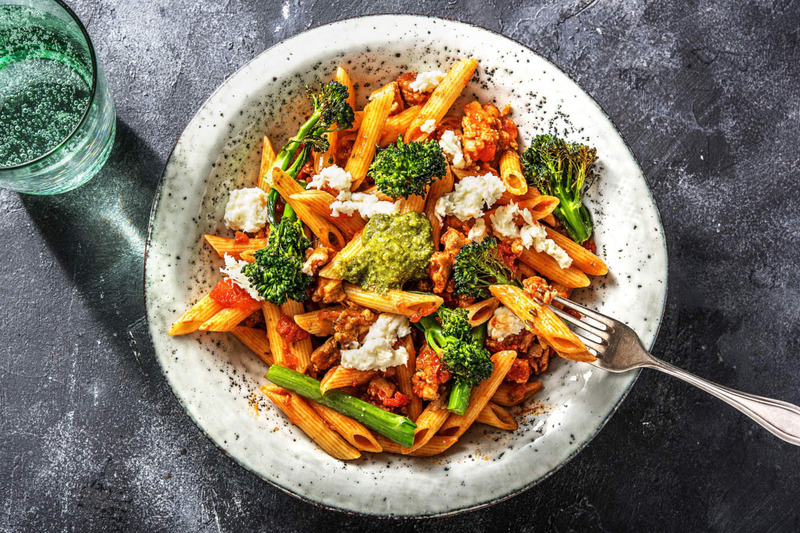 Spoon your tomatoey pesto pasta into bowls and top with the tenderstem® broccoli, remaining mozzarella and a few spoonfuls of remaining pesto. Enjoy!